Alessandro Mottinelli (President of the Organizing Committee): "A great day of sport that rewards us for so many weeks of work. It has been a fabulous edition, and as always when the weather is nice, everything gets better. Our race is growing year by year both in terms of participants and on the technical and organizational level and this thanks to more than 230 volunteers that in these days were available to enhance the Adamello Ski Raid. But the most rewarding aspect was to see more than 3.000 people on the mountains who have decided to go up to support and encourage the participants. Big thanks to all whom have contributed to the success of our competition. " Antonio Rossi (Sport Councilor of Lombardy Region): "It's the first time I follow this race. A great competition, which enhances our mountains, the symbols of our region in terms of landscape and for the history behind them. Also the fantastic athletes, able of taking over 4000 meters of vertical drop with an incredible ease. Will I take part in the next editions? It would take a specific intensive training, especially from the technical point of view; unfortunately I don’t have the time to do it". 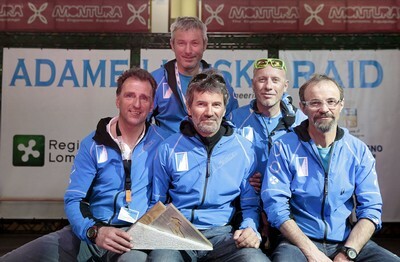 © www.sportrentino.it - tools for sports sites - page created 0,012 sec.